This time we were prepared. We knew exactly where and which concert to go. We even planned to park the car elsewhere and walk to Music Academy, we were that planned but didn't plan for the small detail.. tickets. Music Academy is notorious for parking or lack of it, so we figured out parking elsewhere and walked to the Music Academy hoping to enjoy the concert of TN Seshagopalan. But then the small problem I mentioned earlier became the show stopper. We didn't have tickets and there were 100 other hopefuls like us hovering around for the tickets which simply wasn't there. We stood in the line for a few moments and quickly realized the futility of it. The only ticket that might sold are the 'no show' seats and that would be known only 20 minutes in to the concert. What is the possibility of over 100 people not showing up? None? So, we quickly decide to go Kamarajar Arangam to try our luck with Anuradha Sriram's concert. And this proved to be good choice. When we reached Kamarajar Arangam, Sudha Raghunathan's concert was still in full swing to a full house and we got catch last three renderings. It was standing room only, still we enjoyed every minute of it. Since all the three songs were in Tamil, I could enjoy them better. 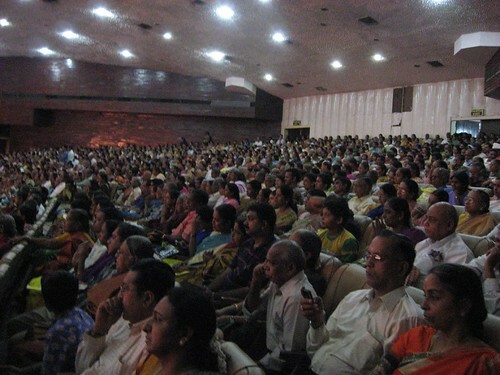 Overflow audience were accommodated on the stage very close to the performer. This is actually a good option which I got to leverage a couple of times few days later. 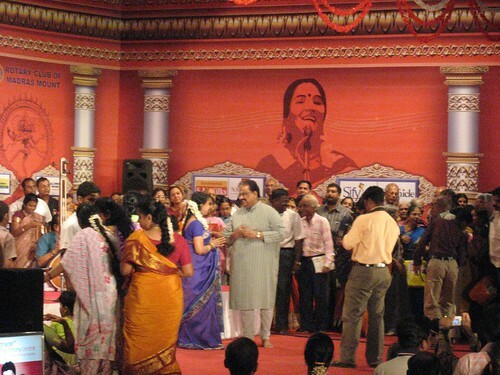 After the concert, SPB was invited to the stage to felicitate Sudha Raghunathan. This was an opportunity for everyone to than everyone and their brother (sister and their dog). This simply went beyond control with people milling all over the place asking for autographs and stuff. This kind of thing ought to scripted and managed properly. 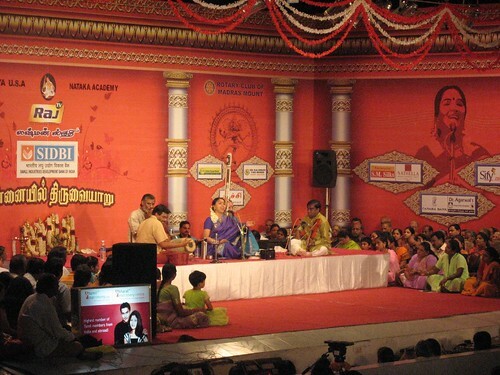 The next concert on the same stage was by Sriram Parasuram & Anuradha Sriram. It started about 30 minutes late due to Sudha Raghunathan's spill over. But the place wasn't as full as Mrs Raghunathan's concert and we got some decent place to sit and enjoy the whole concert. This concert was kind of a unique one, a Hindustani, Carnatic fusion. 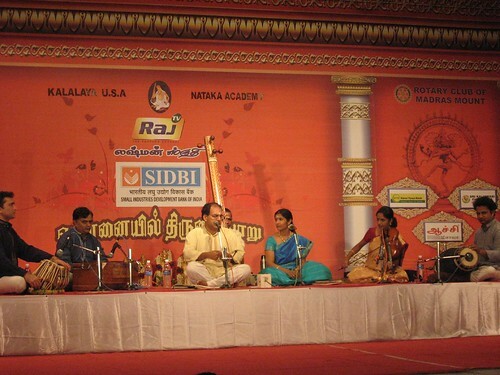 Mr Parasuram was accompanied by Tabla & Harmonium as his accompaniments and Mrs Sriram by Violin and Mrudangam. I have seen / heard lot of 'pairs' performing but this is perhaps the only 'husband and wife' pair performing jointly. Even though Mrs. Sriram is more 'popular' than her husband Mr. Parasuram due to her movie interludes, I actually enjoyed and liked Mr. Parasuram's renderings and voice more than Mrs. Sriram's. Chennai is moving away from being synonymous with Brahmins & Music season, even the instruments like Parai and Udukai are being played by locals from all over Tamilnadu. Kanimozhi proved that last year. Thanks for sharing the music with video. We enjoyed it and felt like we were also attending the concert.